Hi my name is Nikki Barry and I’m going to submit 2 pictures. The pictures are of my female Rylee and her puppies at 6 weeks. This was Rylee’s first litter and she had 10 puppies. Rylee is a light cream & tan GSD with golden brown eyes. 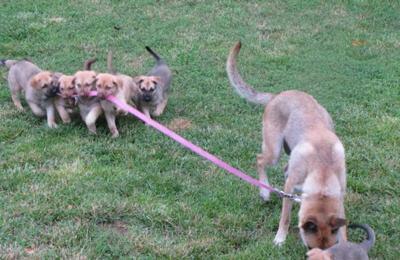 Picture 2 - Rylee is looking down in this picture but it is adorable to see 4 puppies hanging on to her leash with Mischief running to be part of the tug of war. 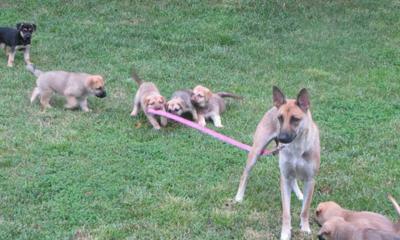 From left: Bandit, Sienna, Chaos, Athena & Mischief running to catch on, Rylee and Gypsy. Congratulations for Rylee and her fist Litter of gorgeous puppies! I love the puppy year and I wished it was longer and didn't grow so fast. A lot of new families will be getting new edition to the their family - Great!!! Take care of those precious little darlings till they new Loving families! Thank you for introducing us to Rylee's first litter! They are so very precious! I love the photos!